I have no stats to prove this claim, but I swear this was the longest winter ever in Chicago. We hadn’t been planning to go away for spring break but we all really started crashing… We needed air that didn’t hurt to breathe and sun that warmed sand. We were all pretty sick of the Spring Break traffic to Florida so I thought, “Hilton Head Island”! We’ve never been there! Two weeks before spring break, I did the check on AirBNB and found a place that we could afford and booked the trip that day. It was the right choice. All four of us loved Hilton Head Island. Highly recommend HHI (as it is known by the locals) for a family trip or with a group of friends. Transportation: We did the drive in 2 days. Stayed outside Nashville on the way there and Ashville on the way back. It would have been a lot for one day, especially because we still hit 3 hours of traffic from Chattanooga through Atlanta. Next time, I’d steer clear of that route and just cut east sooner even though it appears longer. Avoiding Atlanta is always better. There is a toll bridge to enter the island. It was $1.25 in cash collected by an attendant. Word on the street is that the toll will be ending in 2021, but keep $1.25 in the car for each direction for now. There was trolley service on the Island for $1 but we didn’t use it. The walking felt great. Atmosphere: It is a dark sky community so the stars are amazing. They are trying to keep Hilton Head classy, so all of the stores and restaurants have a similar look going. The cohesiveness is comforting and feels less commercial and touristy. The beaches are clean white sand and the area clearly respects and appreciates nature and ambiance. Even the bike/walking trails are curved and shaded. After a long day of all of the activity, you will want to watch a movie or play a game as a family in a place that is nice enough to look forward to coming home to. A hotel room would feel stifling. Activities: We brought our own bikes and the paths are good, although the ride from one end of Hilton Head to the other is probably not worth it. It was 23 miles round trip (with 20 mph winds on our day) and nothing really at the halfway point. I also can’t imagine biking the Cross Island Parkway Toll Bridge but we saw quite a few people doing it. That said, we barely got back in the car. We walk or ride to a cute grocery store, dinner, the beach, shopping. It feels very freeing. There is enough to do, much of which doesn’t cost money (bike rides, tennis, the beach, live music, swimming, etc), but not so much distraction that you feel like you are constantly moving and throwing money at things (I know there is golf as well but I’ve got no info on that). Cost: Hilton Head isn’t cheap, but it is affordable. I got us a lovely AirBNB Villa for 6 nights, 2 bedrooms, very centrally located for $1150, over prime time spring break. I bet it would be even cheaper at any other time. Restaurants are a little inflated, although coming from Chicagoland, not that much. Some of the places were significantly less than we were expecting. Like the 4 of us ate dinner with drinks for $60 at Hinchey’s Chicago Bar up the street from our place. We can’t do that at home. Ever. Weather: I imagine that it is hot and muggy in the summer but we had really lovely weather for spring break. It was 75 on the nicest day and 60 most other days. The evenings were cool. Our place didn’t have a hot-tub but I probably would have used one if it did (especially because we rode our bikes 40 miles and I was embarrassingly sore). A bit too chilly for me to swim but the kids did. Most of the time I wore a skirt and a sweatshirt. We had no bugs or roaming animals to contend with on our stay. IMO– stay as close to this Coligny Circle as your budget allows. EVERYTHING is within walking distance. The beach here is beautiful. The Tiki Hut has great live music in a perfect venue. There are shops and restaurants and groceries, all a quick walk away. It is definitely the hub of the island, but even over spring break, I didn’t find it too insanely crowded. Especially with teenagers, this is the spot with the most stuff to do and I wouldn’t want to be staying anywhere else. We sat ON THE BEACH and listened to live music for hours at the Tiki Hut. The drinks are affordable (I think a beer was $4.50) and the food is fine, but the music and the atmosphere is perfect. I could have done this every single day of the trip. We walked the beach at sunrise most mornings and we wandered it again in the evenings. 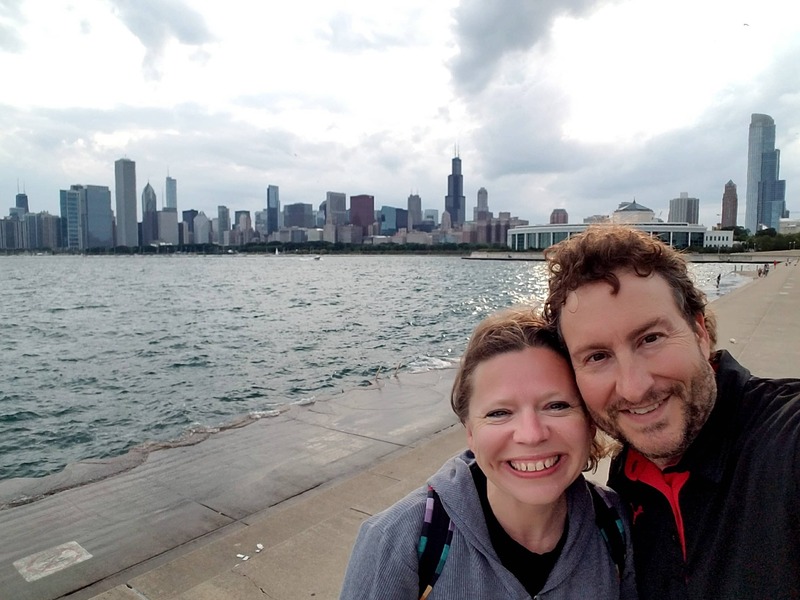 We averaged 8 miles a day and felt like we barely walked. This would be such an easy place to stay healthy and active. The Sea Pines Resort takes up nearly the whole south end of Hilton Head and it is truly gorgeous. It is a resort with lodging and amenities but also has shopping, boat tours, forest preserves, and bike paths. Sea Pines can be entered by the public for $8 a car at the Main Entrance on Greenwood. But it is weird. Even though we are staying less than a mile from the Ocean Gate entrance, Sea Pines doesn’t allow the public to ride their bikes into the resort from any of the entrances (you could probably sneak in via the beach at low tide but that seems complicated at best). There is a locked pedestrian/bike gate with a daily code for people staying on resort property, but us commoners needed to DRIVE our bikes in at the main entrance on Greenwood. We paid $8 for the car and $1 for each bike, parked near Lawton Stables / Heritage Farm, and then rode around. If you don’t have a bike rack, I guess you could drive over to South Beach rental and rent bikes to ride around Sea Pines. Thankfully, the bike hassle was worth it for us. The bike paths are amazing; Well kept and winding and smooth and shaded. 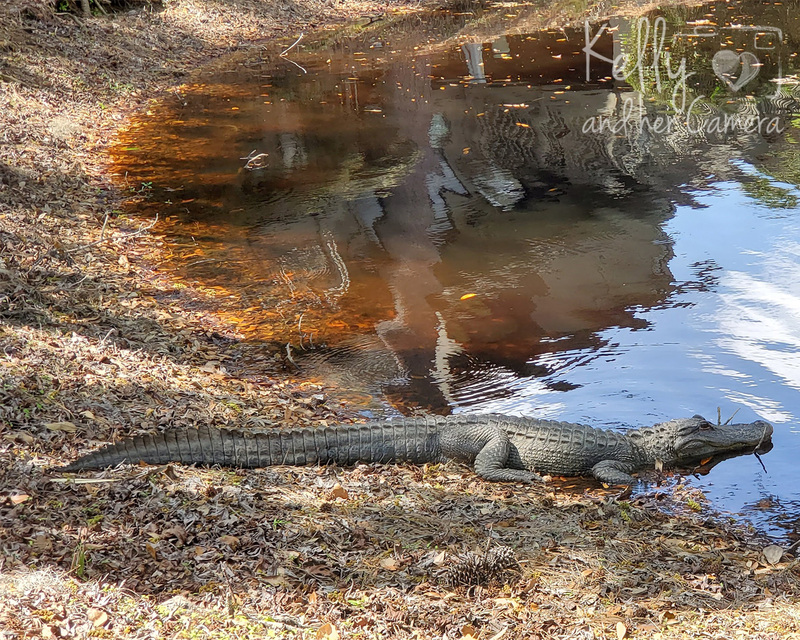 On our 16 mile ride, we saw so many gators and birds and turtles, this day was the highlight of our trip. First, we did the forest preserve. Definitely, the hardest part because the path has a ton of sand. We walked over to the Indian Shell ring (fine, but not as cool as I hoped). Next, we rode to Harbour town, took some pictures of the lighthouse (which honestly wasn’t quite as cool as the ones on Lake Michigan or up by Maine — the plaid was kind of odd), and Thea and I shopped around at the mostly over-priced boutiques. It was time to pull out our snacks before we took the path from Harbour Town to South Beach Marina Village which is pretty much ONLY the Salty Dog. We decided not to eat there. The food was the same as everywhere else on the island. It was a little overpriced but not terrible. We just didn’t really want a big meal and then to get right back on our bikes so we wandered around and looked at the shops and parrots for a bit. From there, we took the southeast path back. Thea and I rode our bikes straight home (we could easily exit at the Ocean Gate but not enter). Jake and Oaken peeled off at Lawton Canal and rode their bikes to the car. It seemed much easier to only load 2 bikes onto the rack instead of 4. We got back to our Coligny Circle home base AirBNB about 10 minutes before them. I nailed the planning of this day. I’d do it EXACTLY the same if I did it again. As much as I liked Sea Pines, I would still prefer to stay as we did, in a villa near Coligny Circle than on any of the resort properties. The resort properties had more amenities, but I liked walking to the beach and shopping and restaurants. The kids disagreed. They would have preferred the pools and b-ball courts and to ride our bikes out of the resort to get food and groceries. We spent a day in Savannah, about an hour from HHI. We hit the Savannah Botanic Gardens first. It was free and adorable and tiny. It is a little out of the way so unless you love flowers as we do, it might be something pretty easy to cross off the list. We had really good Thai food at The King and I while out that way so it was all worth it for us. 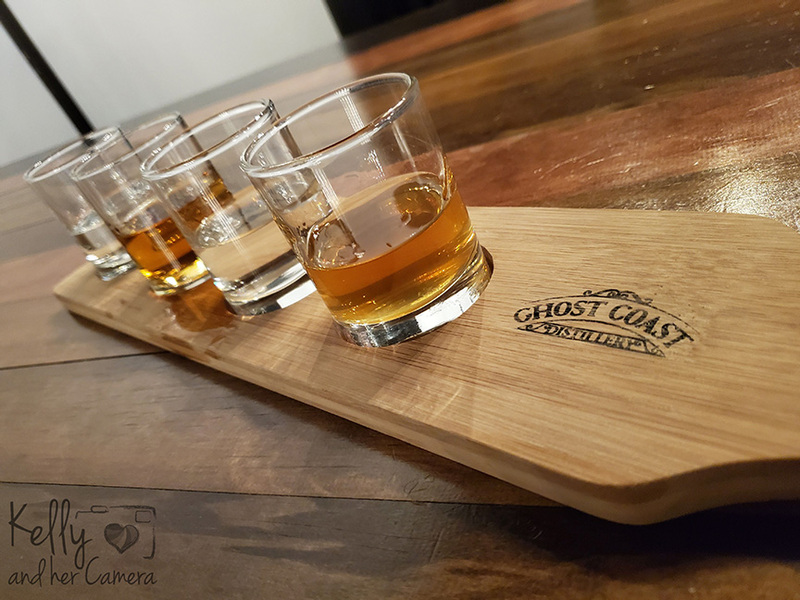 Next, we hit the Ghost Coast Distillery. It opened in 2017 and they just released their first aged bourbon. The tour was funny and interesting. A flight of tastings was $10. Turns out, you can have To Go cups in Savannah, so this tour made the rest of our walk a little more fun. There was a lot of construction in the area which made parking a little tricky, but once that is done, I almost think it could be added to a walk from the River Street portion of the city. For a full circuit self-guided walking tour of Savannah, I’d park somewhere near Montgomery & Liberty. There is a trolley that takes you around town with on-off privileges, but that would have been $100 for the fam and I cheaped out. Instead, we walked over to Forsyth Park (it is very pretty), then walked back toward Broughton, which has a bunch of normal shopping (like the Banana Republic) and then walked toward River Street. The River Street area was worth the crazy steps down. It was so cool that I don’t want to describe it. You just need to go. It started raining while we were down there and the fam squad decided we wanted to head back to our place at HH. I wasn’t ready to go but I was outvoted when everyone else didn’t feel like walking around in the rain (wimps). Basically, this wasn’t my best planned day. If I did it all again, I’d probably skip the Botanic Gardens, spring for the historic tour trolley and spend more time on the River Street portion. I’d probably go back to Savannah but there is no way the family would want to take the hour drive each way. But the town was really cool and I wished I saw more of it. Not a ton of downsides to Hilton Head Island. It was a really good trip for all 4 of us. If I had to say something: The cultural diversity is lacking. I always say that I couldn’t make anywhere but Chicago my home base. I love the range of people and food and entertainment. This happens almost every trip, but we couldn’t bear anymore fried food or cheese. I couldn’t find an Indian buffet or stir fry and we had to go miles and miles to find Thai. There were a few boutique / local art places on the island and a great cajun place, but I would have liked more. I imagine it is hard to keep those places in business but I would have loved to find a section of town with a bunch of local artists like one finds on the west coast or in Chicagoland. We stayed 6 days and I thought that was perfect. But I could have stayed longer. Hilton Head is worth visiting. Strongly recommend.